I was thrilled, humbled, and surprised when I received the “call” about being selected as the 2011 TI:ME teacher of the year. Each year, the Technology Institute for Music Educators recognizes an outstanding music teacher with the Mike Kovin’s Award. The award is presented at the annual TI:ME conference – this year it will be in Cincinnati, Ohio in January. I’m proud to be counted among some of the greatest innovators and educators in Music Education today including: Dr. Rick Dammers (2010), Wayne Splettstoeszer (2009), Ace Martin (2008), Mike Fein (2007), Karen Garrett (2006), and the first recipient of the award, Amy Burns (2005). I am particularly thankful to Dr. Jay Dorfman for nominating me for the award and to all of you that spoke or wrote on my behalf. 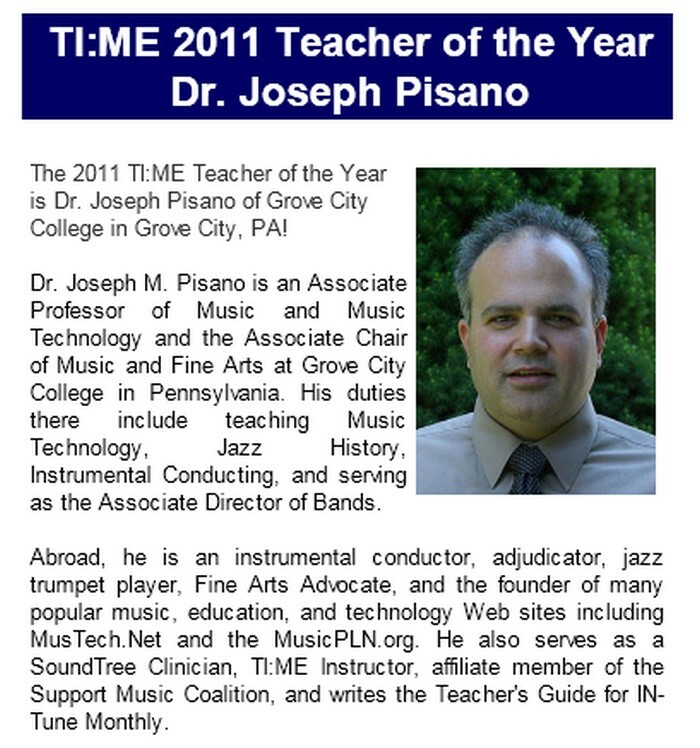 The 2011 TI:ME Teacher of the Year is Dr. Joseph Pisano of Grove City College in Grove City, PA! Dr. Joseph M. Pisano is an Associate Professor of Music and Music Technology and the Associate Chair of Music and Fine Arts at Grove City College in Pennsylvania. His duties there include teaching Music Technology, Jazz History, Instrumental Conducting, and serving as the Associate Director of Bands. Abroad, he is an instrumental conductor, adjudicator, jazz trumpet player, Fine Arts Advocate, and the founder of many popular music, education, and technology Web sites including MusTech.Net and the MusicPLN.org. He also serves as a SoundTree Clinician, TI:ME Instructor, affiliate member of the Support Music Coalition, and writes the Teacher’s Guide for IN-Tune Monthly. Like every other discipline, Music Education is being faced with a myriad of widely available new technologies that are already being incorporated into our profession. Some of these technologies have been adopted by Music Teachers and most are already being used by our students. Business and Industry leaders are very concerned that our students have the ability to be creative in their future jobs. Because learning music is by its very nature “creative”, there has never been a greater relevance or need for music instruction to be given to our students; not only the “traditional” music students, but all students. Through an examination of the 21st Century Skills Map by The Partnership for 21st Century Skills, this session will look at how new skills can be combined with Music and the Arts instruction and the need for Music Teachers to acquire and utilize these skills in their learning environments. Noteflight is a free and easy-to-use music notation software that provides many opportunities for you and your students. With Noteflight, you can create a variety of scores including technical exercises, chorales, excerpts, etc. and share them with your students online, for free! The software also allows for audio playback and embedding your score directly on your own Web site. This session will discuss how Music Educators are mobilizing online and transcending traditional professional development opportunities by utilizing social media and Web 2.0 tools. In particular, this session will focus on the WordPress family as a means for PR and Communication among educators. A brief overview of newer technologies such as Professional learning Networks (PLNs) and platforms such as Twitter and Google Apps will be discussed as well. In addition, I will be presenting a clinic on Current Music Education Technology for PMEA District V on February 10th in Farrell, PA, attending and helping with adjudication at the PA Intercollegiate Band Festival on March 4-6 held this year at Juniata College, and will be hosting our college’s booth, Grove City, at PMEA in April. I hope to see and “catch up” with many of you at these events.